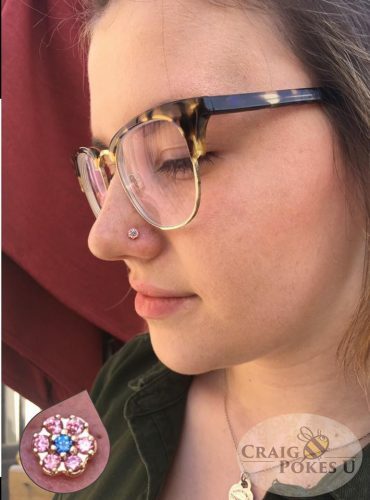 Our happy client was instantly drawn to this 14 Karat Rose Gold 7 Stone Flower for her nostril piercing; and after only a minute of contemplation went for it. She couldn’t have been happier and bounced out of the studio with a wide grin! We aim to please here, at the CraigPokesU Studio with the area’s largest variety of quality jewelry. Stop by the studio at 4818 Lee Highway in Arlington, Virginia and treat yourself to yours today!